Add a bit of zip and zest to your next holiday meal! Change up your mincemeat pie with chopped apples, a hefty splash of cognac and a handful of sweet raisins. Some like to gild the lily with whipped cream or some vanilla ice cream on top. Place mincemeat into a large mixing bowl; add apples, raisins and one half of cognac, if using. Stir to mix thoroughly. 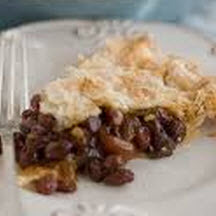 Place 1 pie crust layer in the button of a 9-inch pie pan*; fill with mincemeat filling. Dot with butter; add remaining cognac. Cover with top crust, seal and slit in 2 to 3 places. Brush top crust with beaten egg yolks; bake 20 minutes. Reduce heat to 400°F (205°C) and bake 20 minutes. Reduce heat to 350°F (175°C); bake 20 minutes or until crust is browned. Remove from oven; cool on a wire rack.